This time-lapse image by Chris Newsome shows the trail of the International Space Station (ISS) across the sky with Space Shuttle	Atlantis docked during mission STS-117. The image was taken around 23:00 BST on the 10th June 2007 during the first full orbit with the craft docked together. 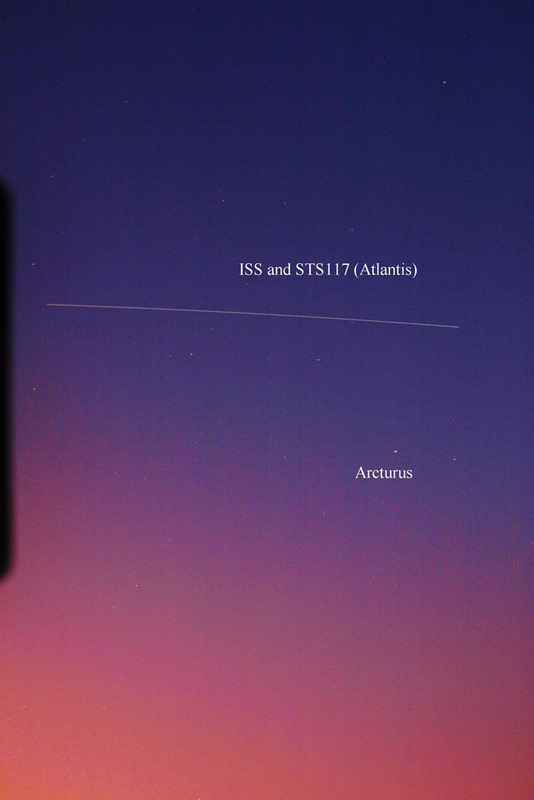 The linkup had occurred on the previous orbit at about 20:35 BST while the two craft were over Australia and their first pass over the UK after that was in daylight (the pass Chris captured here was the first after sunset in the UK). A Canon EOS300D camera was set up on the back of a Skywatcher 102T telescope which was in turn placed on a CG5-GT mount and pointed in the direction of Arcturus. The spacecraft approached from the west horizon to pass over Derby at an altitude of 62°. The camera exposure lasted 30 seconds and was taken at 200 ASA. The image was processed in CS2. Chris remarks that initially he pointed the set up at Vega before he realised he was pointing in the wrong direction and moved it! When he checked the screen at the back of the camera he thought he had missed the trail. A week later he decided to check the memory card in the camera just before he was about to press the delete button and there was the trail - straight across the field of view with Arcturus below it and the trail itself going straight through Corona Borealis! So, ALWAYS CHECK YOUR CAMERA. You never know what you may miss!